Springtime is already here and we are making arrangements in our wardrobes and getting excited about shoes trends for the season. Fashion media have pointed out some of those trends, such as the sneakers, the mules or sandals. Following you’ll find a quick overview of them. Nowadays, sneakers are a regular feature of our closets. Comfortable and trendy, they are a good option to be fashionable and comfortable at the same time. For this season, Louis Vuiton has a special proposal, the Louis Vuiton’s futuristic sneaker. It has wave-shaped outsole and a long tongue. Mules are those shoes with no back. They have a long history, centuries ago they used to be popular as indoor shoes and today they are trendy footwear. Flats or heeled, made of suede, leather or sateen, they are part of this spring outfit. Last but not least, sandals are the best allies for spring and summer. This year’s fashion proposals go from satin flats, kitten heels, platforms, big toe strap to super strappy ones. Any of your preference will do to make you look great. So, after having given a look to this year’s shoe trends, it is going to be useful to have an insight on how to take care of them. 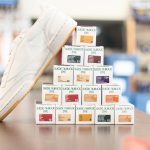 For this regard, Tarrago has a the right products to maintain our shoes. So, following you’ll find some recommendations for that purpose. 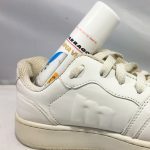 In the case of the sneakers, you can regularly use the Tarrago Sneakers Cleaner, it is a foaming detergent with high cleaning power, conditions and deodorizes leaving a pleasant and delicate fragrance. Cleans effectively without damaging the original texture and colours. You can find this cleaner in spray or in wipes, so if you are planning a trip you can take them with you! If you are going to wear mules and sandals of any material, satin, suede, etc, Tarrago has an ‘all in one’ solution, the Tarrago Shampoo. It is a dry cleaning mousse to clean smooth leather, synthetic leather, suede, nubuck, oiled leather, fabric and micro fibers of all colours. So, you can apply it to your satin mules with kitten heels , your suede slip-on sandals or suede mules, or to your leather sandals. If you are looking for specific care depending on the material, don’t have doubts and contact us, we will be very happy to suggest you an specific product. «Spring is nature’s way of saying let’s party» (Robin Williams). So let’s get ready to enjoy the season! !